Vassar Temple Advocacy Group Goes to Albany! 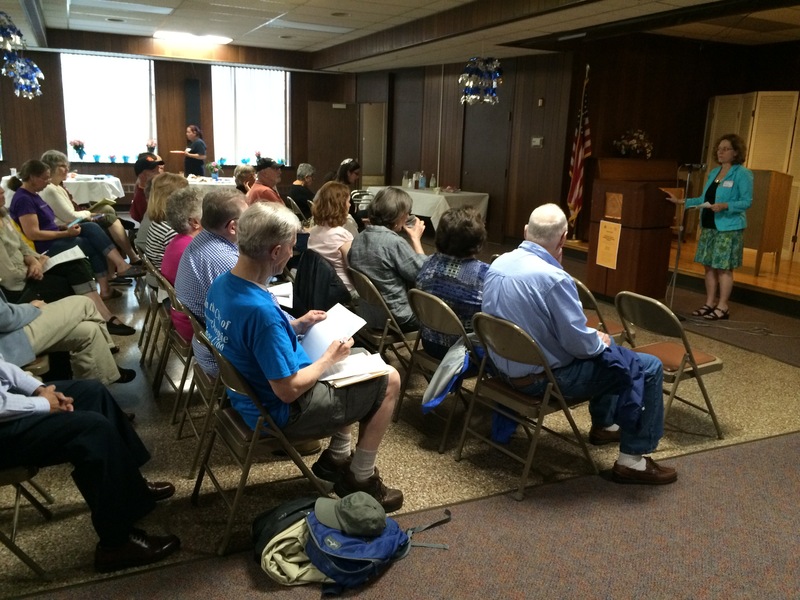 Andi Ciminello, Howard Susser and Marge Groten joined other Reform Jewish Congregations in Albany on Monday, May 8th for a Lobby Day organized by Reform Jewish Voice of New York State. 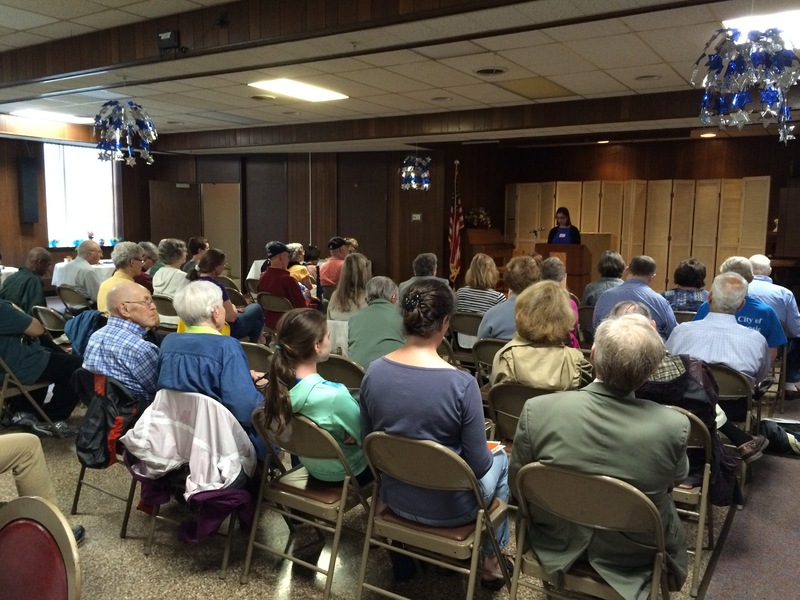 The event was attended by approximately 30 people. The morning session was devoted to training the participants on the issues on the organization’s agenda for the day of lobbying and on lobbying techniques. Presenters included the Co-chairs of Reform Jewish Voice; Assemblywoman Pat Fahey; staff from NYS Attorney General Eric Schneiderman’s office and a legislative assistant from the Religious Action Center, in Washington DC. opposition to the Education Affordability Act, which would provide extremely generous tax credits to those making donations to private and parochial schools. In the afternoon we meet with Assemblyman Frank Skartados, a staff person working for Assemblywoman DidI Barrett (a Vassar Temple member) and a staff person in Senator Sue Serino’s office to discuss all of the issues on the day’s agenda. We all felt the event was very worthwhile and encourage Temple members to take the opportunity—either in Albany or locally—to lobby our state legislators on issues identified by Reform Jewish Voice of New York. Speak to one of us if you are interested. 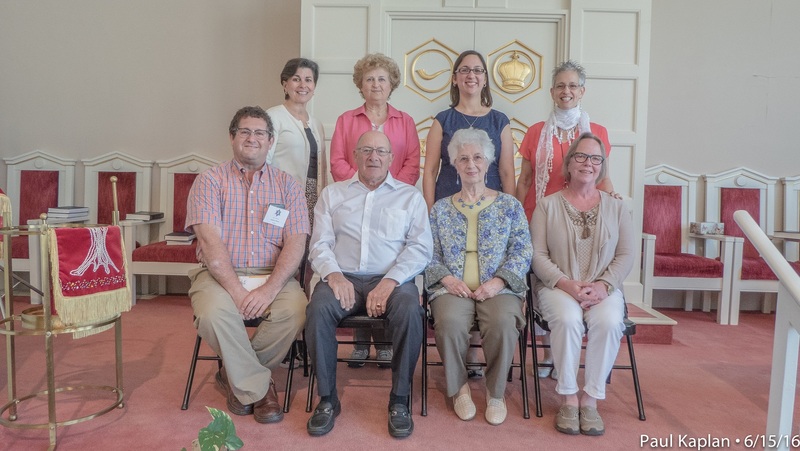 On June 15, 2016, approximately 150 individuals, including a group of 30 educators from Long Island, gathered at Vassar Temple to examine one of the most significant refugee events in world history. COMPLICIT, the documentary film featuring the story of the SS Saint Louis, was shown. This film, COMPLICIT, chronicles the story of the SS Saint Louis, the ship that sailed from Hamburg, Germany in 1939 with 937 Jews aboard trying to escape Adolf Hitler’s “Final Solution.” The film explores the Roosevelt administration’s role in a series of events that transpired as the ship sought entry to Cuba, the US and Canada, and was ultimately denied access and returned to Europe. Approximately one-third of the ship’s passengers who had to return to Europe did not survive the Holocaust. A discussion with the film’s director, Robert Krakow, who traveled to Poughkeepsie from his home in Florida for this event, as well as Sonja Geismar, a survivor of the SS St. Louis, and local resident Debbie Sylvester, the daughter of another survivor, followed the screening. In 1939 the SS St. Louis departed Germany for North America. Among her passengers were 937 Jewish refugees fleeing Nazi persecution and seeking entry into the United States through Cuba. But upon arrival, the ship’s passengers’ visas were rendered invalid and they were denied entry. After several weeks at sea pleading with the US, Canadian and Cuban governments, the SS St. Louis was forced to return to Europe where it is estimated that nearly one-third of the passengers perished in German concentration camps. Through historical film footage, survivor interviews and dramatic interludes, COMPLICIT recounts the story of this ill-fated voyage. Included in the film is a mock trial that confronts the Roosevelt Administration’s flawed WWII refugee policy, based on a play written by Krakow. In addition, COMPLICIT documents the US State Department’s formal apologies to the surviving passengers of SS St. Louis. Robert Krakow is the Executive Director of the SS St. Louis Legacy Project Foundation, a nonprofit organization that uses education through drama to enlighten audiences on events in world history, including the story of the voyage of the SS St Louis. This was an extraordinarily rare and moving event in our community as it included the film’s director, Robert Krakow, participating in a discussion with a survivor and family members of survivors after the film. 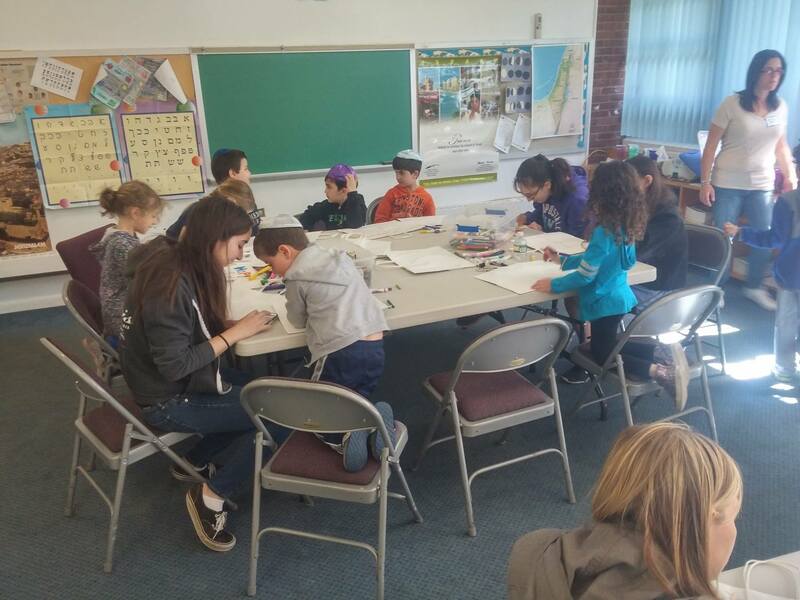 The event was organized in partnership with the Long Island Temple Educators (LITE) with support from the Irving and Gloria Schlossberg Family Fund of the Community Foundations of the Hudson Valley and the Poughkeepsie Library District. Vassar Temple organizers were Bob Ritter, Jennifer Sachs Dahnert, and Cathy Bokor. 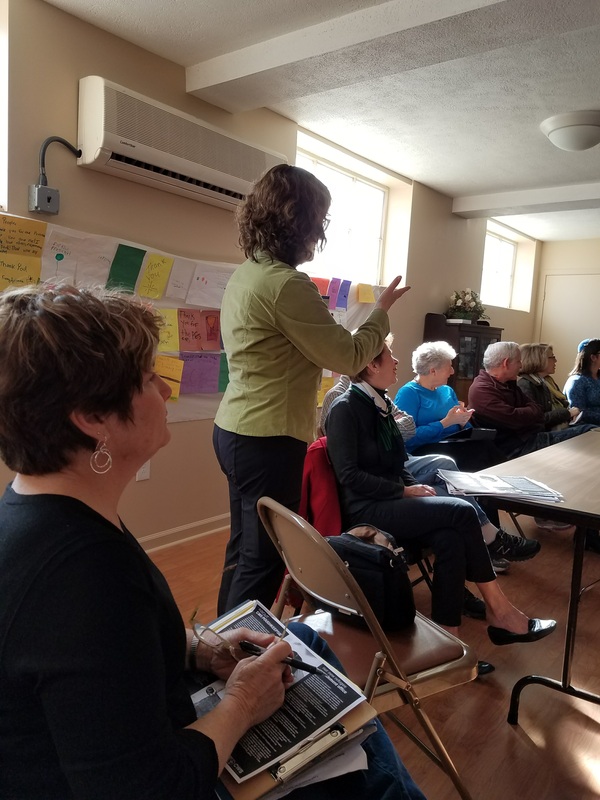 November 13th – Vassar Temple holds a meeting to start organizing our “Welcome Team” in accordance with the role that Church World Service has sponsors play. Link to information on the Role of Refugee Welcoming Teams. 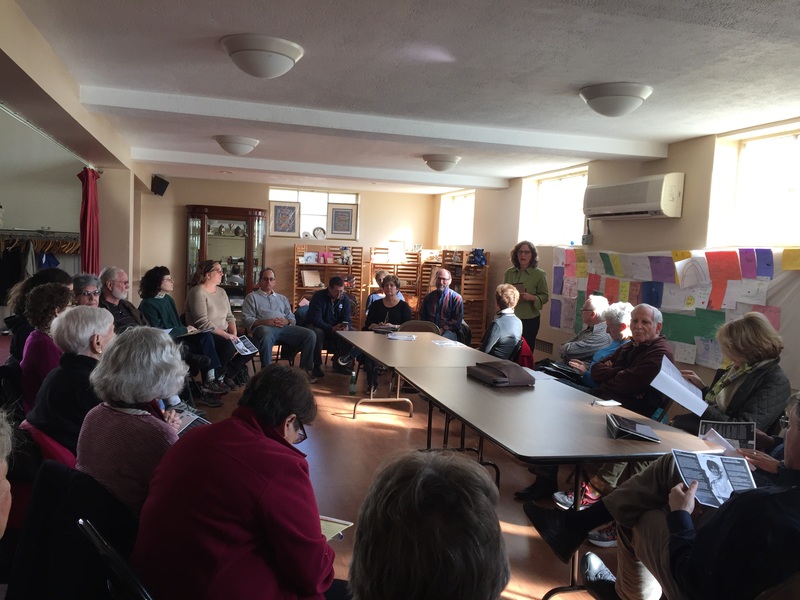 Follow this link for HNN news coverage of a recent Church World Services informational meeting. 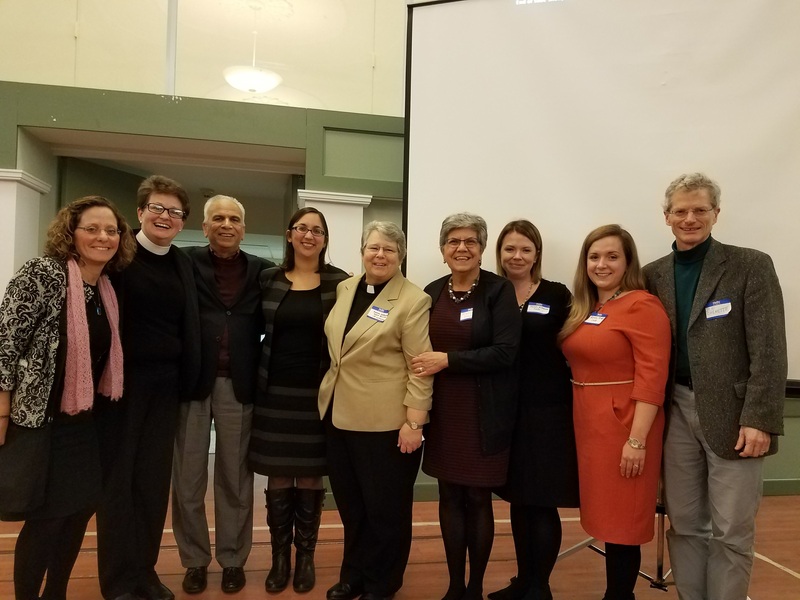 Introducing the refugee resettlement initiative to an audience of over 300 at a community meeting held Nov. 6 were Andi Ciminello (Vassar Temple refugee resettlement), Rev. Susan Fortunato (Christ Episcopal Church), Umar Ahmad (Masjid al Noor), Rabbi Leah Berkowitz (Vassar Temple), Rev. Deborah Hafner DeWinter, (First Evangelical Lutheran Church), Dr. Maria Hoehn (Mid Hudson Refugee Solidarity Alliance), Sarah Krause and Roisin Ford (CWS), Jon Chenette ( Interim President, Vassar College). The first refugee families are expected in early 2017. 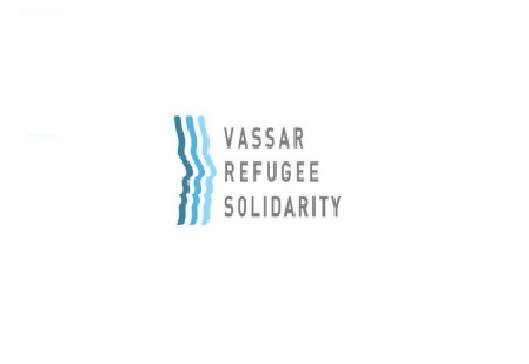 To help please contact refugee@vassartemple.org . Images captured at the Mid-Hudson Refugee Solidarity Alliance “Community Meeting” at Vassar College. 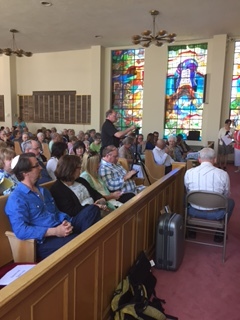 A packed room of people from the community, college faculty, students, clergy, representatives of Church World Services, local government, and supporters for the Alliance, gathered at Vassar College to hear an explanation of the refugee resettlement efforts, let voices be heard, and questions answered. Earlier this year the Vassar Temple Board voted to join Vassar College Refugee Solidarity Project, a project to support refugee resettlement in Dutchess County through a collaboration with Vassar College and local faith-based institutions, including Vassar Temple, Christ Episcopal Church, the Mid-Hudson Islamic Association, along with Duchess Community College, SUNY New Paltz, Marist College and Mount St. Mary College. This project is moving forward! Church World Service (CWS) received approval from the U.S. State Department to receive and relocate refugee families to the Hudson Valley, all of whom have been screened and vetted through the offices of the US State Department and Homeland Security. 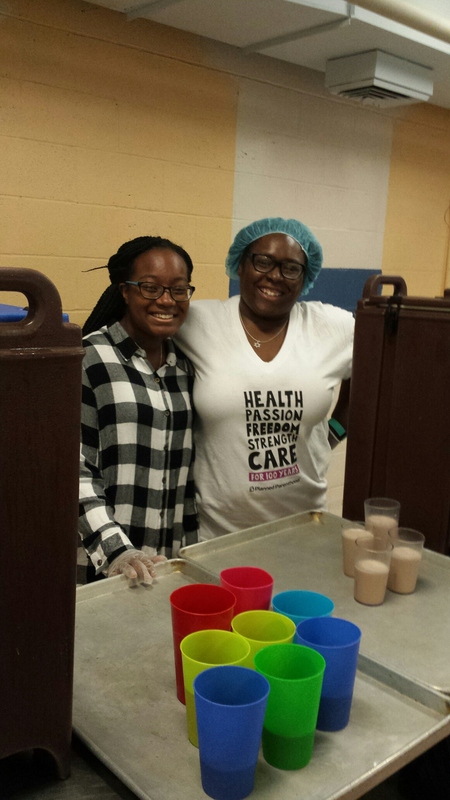 As sponsors, Vassar Temple will work with CWS to assist the designated families with resettlement through financial support, and guidance with housing, schools, medical care and employment. Click here for information about CWS. 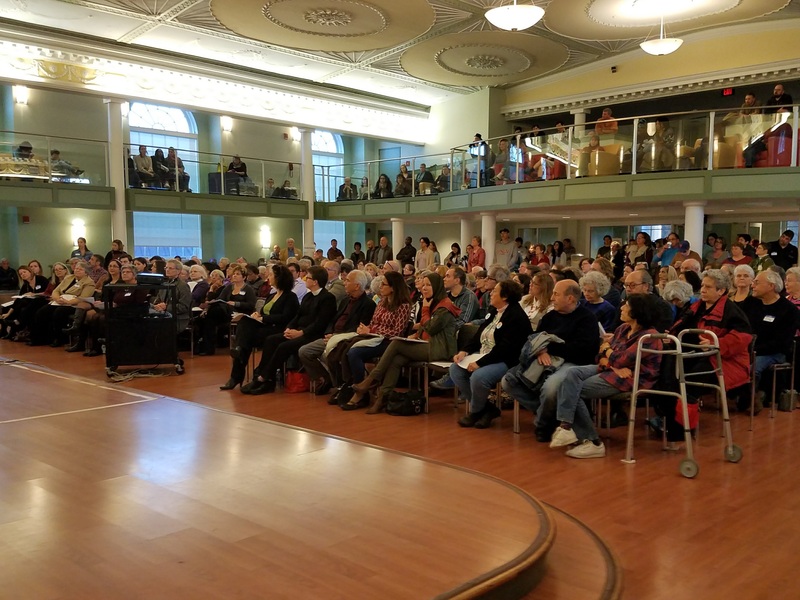 Over 300 participants attended standing-room only Community Meeting at Vassar College on November 6th.. 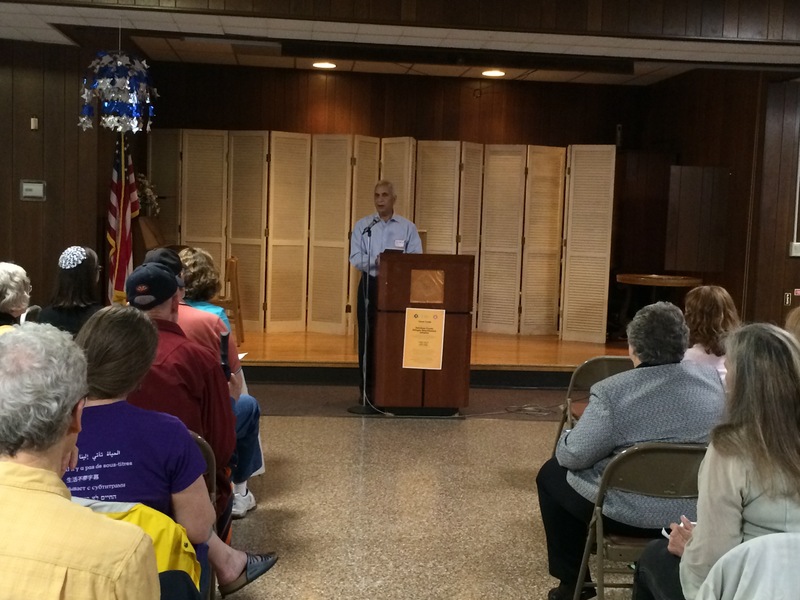 Representatives from CWS, addressed questions about the resettlement process. 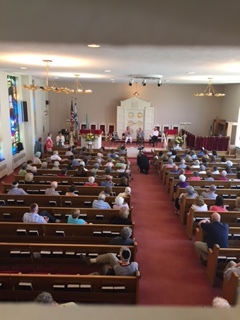 Rabbi Berkowitz led the clergy welcome along with the other founding faith-based congregations, Christ Episcopal Church and Majid Al-Noor Mosque. Together they reaffirmed our dedication to welcoming refugee families into our community. Representatives from the different sponsor groups were also in attendance to express their support and work on committee assignments. We are very proud to note that Vassar Temple was the first to make this very important commitment, setting a fine example of leadership for other congregations and fellowships in our region. As many of us have watched the current refugee crisis unfold, we have felt helpless in our ability to take a concrete action to make a difference. With this project, we can do more than advocacy and fundraising; we can welcome a family to our community and demonstrate our commitment to addressing the worldwide refugee crisis. Link to Video of the meeting. We are thrilled to announce that Church World Service (CWS) has been approved by the US Department of State, Bureau of Population and Migration (PRM) to open a refugee resettlement office in Poughkeepsie, New York. More details will be forthcoming soon. We will also be in touch very soon about a meeting of our community at Vassar College to discuss the way forward. By then we will also have more information from CWS. A public information session with staff from CWS headquarters will also be held onThursday, November 10th (2 – 7PM) at a location to be determined. Thank you for your continued support and looking forward to our important work ahead. Church World Services (CWS) is awaiting official approval from the US State Department. 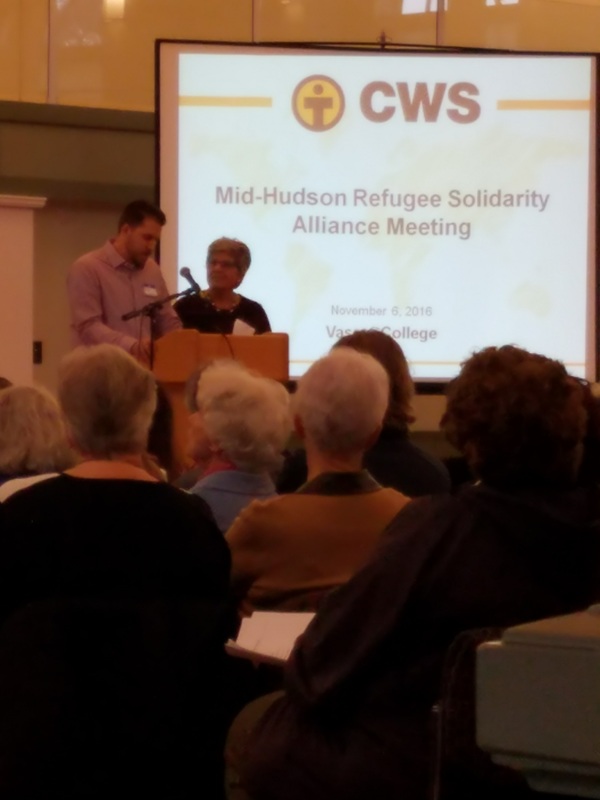 Upon receiving approval, CWS looks forward to meetings with the community and partners and Vassar Solidarity events to prepare for refugee welcome in the Hudson Valley. Any interested individuals can sign up here Email Sign Up to receive future updates from CWS directly. We will of course also stay in touch with you about updates and news. CWS is asking us to encourage individuals, faith communities and organizations to visit http://www.refugeesarewelcome.org/get-involved/ and sign an electronic postcard to be sent to President Obama. Community and faith-based organizations can also bundle signed cards and mail them to 110 Maryland Avenue, NE, Suite 110, Washington, DC, 20002 by September 12th so they can be delivered to Congress and President Obama before the UN summit on refugees. The president and congress needs to hear from you. Please urge President Obama that the U.S. needs to lead by example in responding to the refugee crisis at the upcoming UN General Assembly and White House Summit. As soon as CWS receives the official approval, we are planning a large gathering with them at Vassar College for all the individuals and groups involved. We are grateful for all your support and what you have done to help us move this initiative forward. We extend a warm welcome to our new partners. 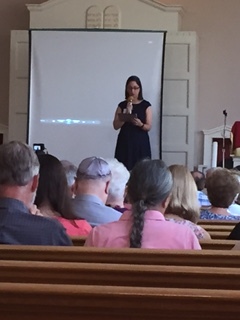 On Sunday, June 5th more than 50 members of the interfaith community gathered at Vassar Temple to learn more about the Vassar Refugee Resettlement Project. 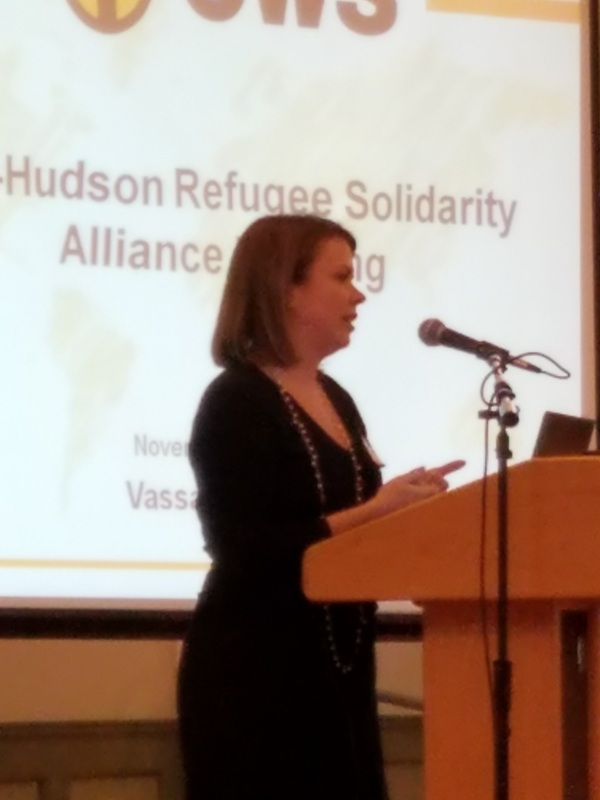 This project, led by Dr. Maria Hoehn, of Vassar College, is working with faith-based communities to resettle refugee families in the Hudson Valley. Vassar Temple, Christ Church and Masjid-Al-Noor – the three Abrahamic Faiths – have each committed to sponsoring a refugee family through the US Department of State’s resettlement program. The meeting was an opportunity to introduce the community to this very important project and to learn more about the resettlement process. 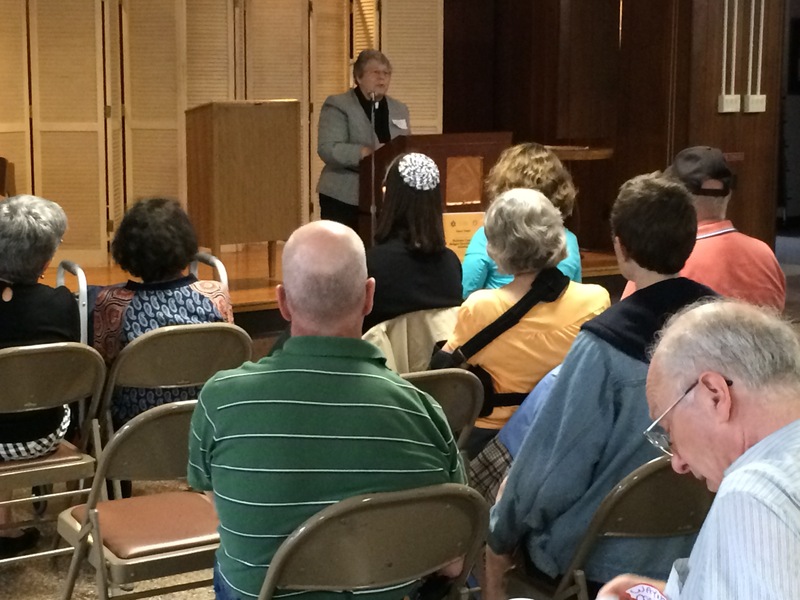 Rabbi Berkowitz opened the meeting with a Jewish teachings about welcoming the stranger. We also heard from Dr. Hoehn about how the project has been developed with education and outreach among Vassar faculty and students. Participants from Masjid-Al-Noor and Christ Church reaffirmed their commitment to the project. We were very fortunate to have Pastor Deborah Hafner deWinter from First Lutheran Church speak about US Refugee Law & Policy. 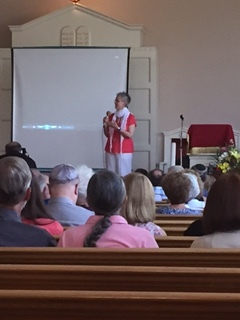 Pastor Deborah has worked with Church World Service and other organizations on refugee resettlement project in this country and overseas. 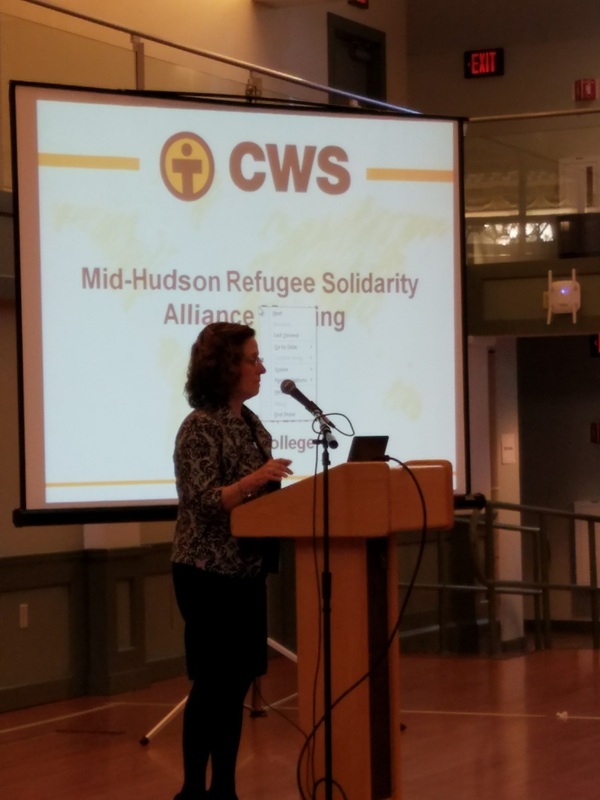 • Church World Services (CWS) has submitted an application via the NY State Refugee Coordinator to the U.S. Department of State for establishing a VOLAG in Poughkeepsie for the lower Hudson Valley. o This VOLAG or Voluntary Agency will be the nodal agency responsible for resettlement. • If the application is approved, we can expect to start resettling refugees by December/January in our community (and a 50-mile radius) and will need your efforts and enthusiasm to ensure our community is a welcoming place for all. • Once we have the go-ahead (hopefully by mid-July), we can start getting ready to collect furniture and other useful items. The Arnoff family has generously offered a trailer to be kept at Vassar College for that purpose. • Vassar Temple, Christ Church and Masjid-Al-Noor are the three congregations so far that have officially committed to co-sponsor one family each together with CWS. o There is enthusiasm from other congregations to join the effort and we are waiting for the approval of the VOLAG to welcome more partners. Looking forward to a sustained and fruitful partnership. Together we can make a difference in the lives of refugee families. Hello, Jasmaine Russo here. First time blogger, long time reader. 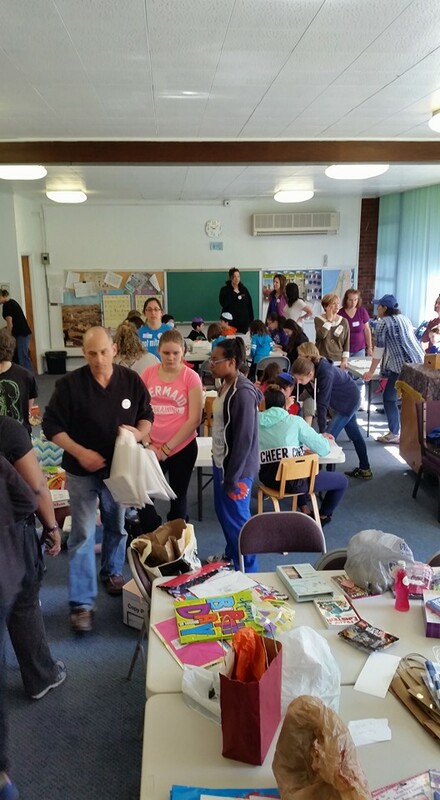 Today I had the honor and privilege to bring the Birthday Project to Mitzvah Day 2016. So what is it all about? Where did it come from? Well, I’m glad you asked. My daughter, Jordan, needed an idea for her Mitzvah project. While searching the web, we came across an organization called Family to Family. 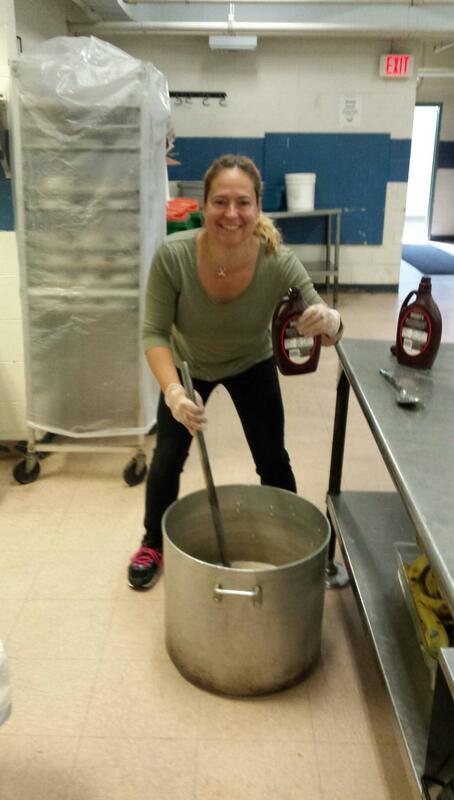 http://www.family-to-family.org/hands-on-giving-projects/handson-birthday-giving-project/ . They had an intriguing idea about, giving underprivileged children a birthday celebration in a bag. It would include cake mix, frosting, candles, book, and an age appropriate toy. Many of us celebrate our children’s birthdays without a second thought. I always plan our vacations around our girls’ birthdays, to make them especially memorable. I grew up in a single parent household, and birthday celebrations were not always a possibility. Times were tough. I remember my 7th birthday when my mom walked to a 7-11 and bought me a doll. I can’t imagine how she found the extra money but she did. Here it is 30 years later and still remember, how happy I was to have something on my special day. I explained all of this to Jordan and how we could give other children the same excitement. Jordy set a goal of 5 bags per month from October 2015 until October 2016. We contacted Family- to- Family and they linked us with the Boys and Girls Club of Orange County. It was very exciting expanding this project to include our Jewish Community. We had a goal of fifty bags and we pulled it off!!! I asked the director of Boys and Girls Club for a list of kids with age, birthdate, and interests. Then I assigned each child a number, that way people could adopt or donate money towards the cost of a child’s bag. Nancy, the admin, for the Jewish Federation of Dutchess County linked me with The United Way of Dutchess County, and they donated the books. 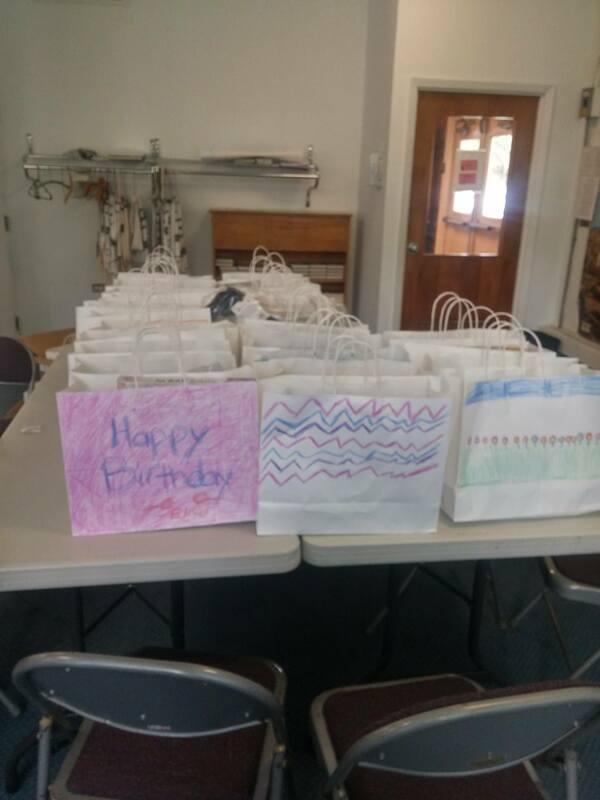 Vassar Temple gave Tzedakah money, and the Jordy’s B’nai Mitzvah classmates adopted bags. 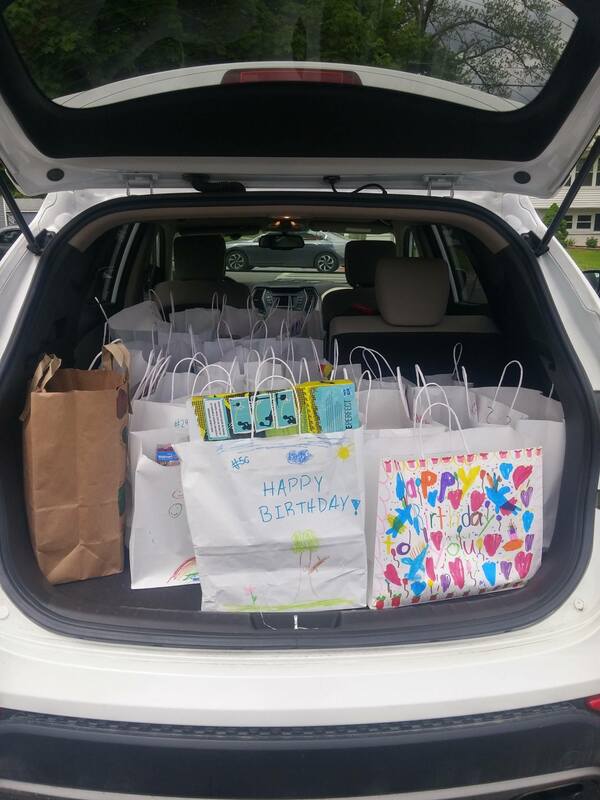 Marian Schwartz bought birthday bags that smaller kids could decorate. 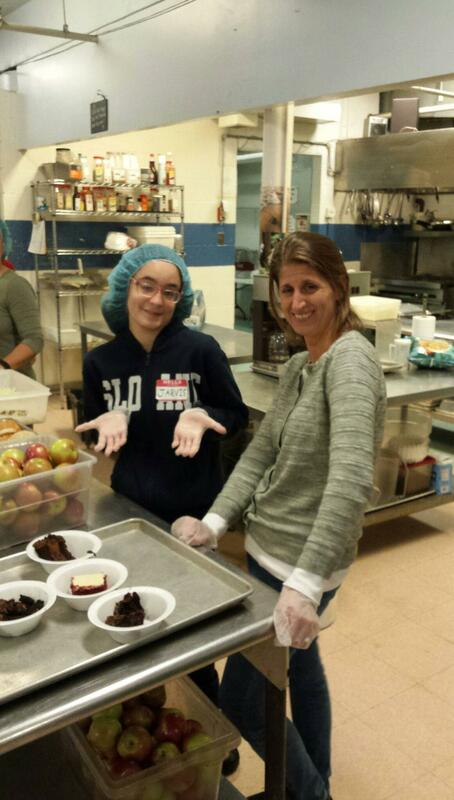 We set out boxes in Temple Beth El, Vassar Temple, and Beacon Hebrew Alliance to collect cake, mix, frosting candles, etc. Jordy and I took all the donated monies, bought scrip, and purchased the toys based on the children’s interest. When we arrived at Temple Beth El, I did not have any idea how this was going to unfold. Fortunately, our community pulled it together. 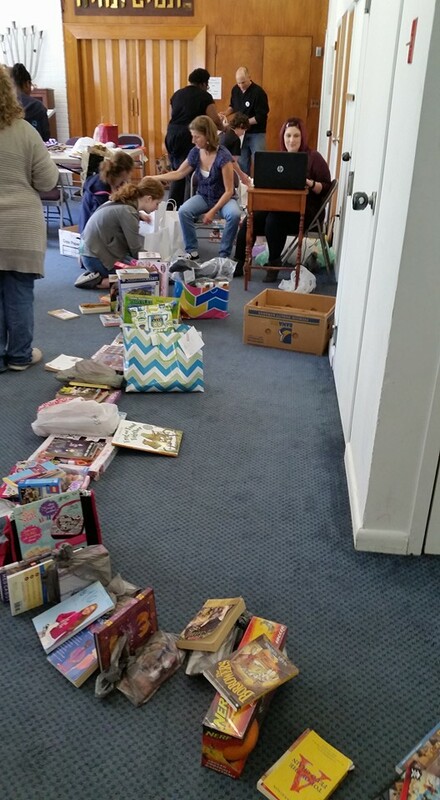 So many donations, in addition to what we had, started piling on the tables. Within minutes we had a makeshift assembly line. 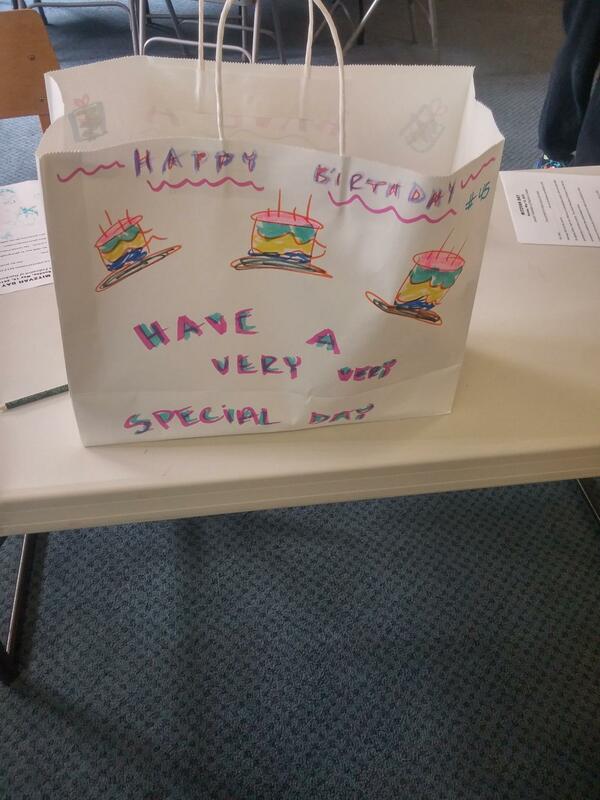 Station 1 was decorating committee, Kids and their parents decorated bags with drawings and sweet birthday messages. Station 2 was the sorting. Any new items coming into the room, were dispatched to the proper areas. Station 3 was the cake mix station. This is where the cake mix, frosting, and candles were bundled. Station 4 was where the toys and books were put together and placed in numerical order. Station 5 was the command hub. Here is where the bags were assembled. Kids would drop off their artistic creations, the cake mix bundle would be added in, then the gift would double checked against our spreadsheet. Volunteers wanted to make sure each gift was age appropriate and matched the child’s interests. Station 6 was the last check off. Here birthday goodies would be added such as bubbles, candy, napkins, plates, and/ or cups. I still cannot believe we pulled it off. All the volunteers went above and beyond to make sure each bag was given extra TLC. A few times I got a little teary eyed watching my community at work. 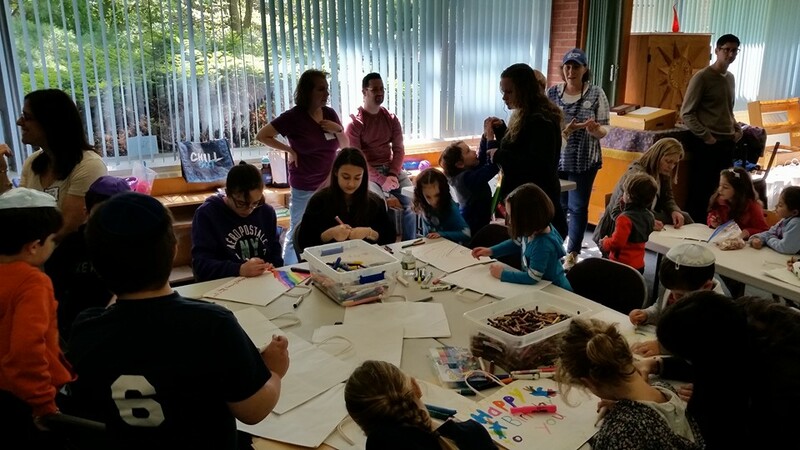 This project embodies the spirit of Mitzvah Day. We banded to together to give these children, a chance to do something many of us take for granted. Celebrating the day, a child came to be and the simple joy in life of being a child. Thank you everyone for all you help and support. I know I could not have done ANY of this without the volunteers. I hope that we will be able to do this again next year.